This was a day that we had been told to look forward to. 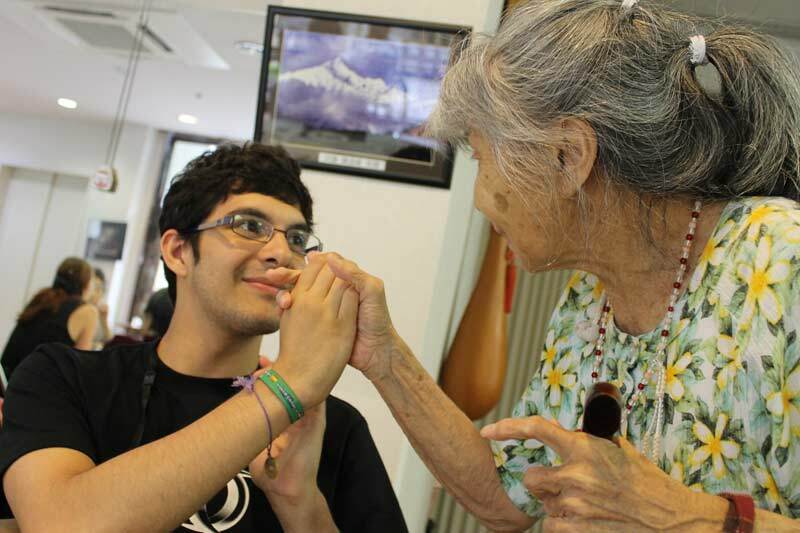 All the WCJ counselors had told me and the others that visiting the residents of the Murou-en elderly people’s home was one of the true highlights of this particular session. After being driven to Murou-en by some of the host families through the beautiful mountains of the Uda area, we arrived at the facility’s front gate where we were greeted by members of the staff. As we entered, I noticed that the attention of almost every single resident in the lobby area immediately turned to our group. It was quite heartwarming to watch as the faces of the residents started to light up at the sight of us. We were greeted by warm happy smiles with every step we took, and it wasn’t long before we found ourselves sitting down amongst the residents at the tables that had been prepared for the occasion. What had been prepared for all of us, was all that we would need to do calligraphy: brushes, ink, old newspapers, examples of kanji (Chinese characters used in Japanese writing and Calligraphy) and Japanese fans for us to write our kanji on. 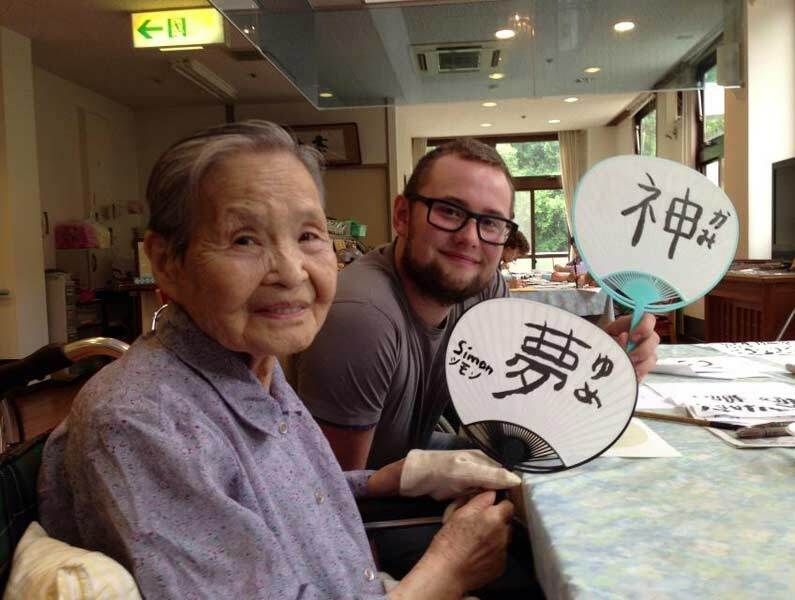 Calligraphy proved to be a good choice for an activity to do with the residents, as I speak only a little bit of Japanese, and they know no English at all (their hearing was also quite impaired, which didn’t exactly help communication either!). After introducing ourselves and our respective home countries, we began making calligraphy on the fans. The first elderly lady I was paired with unfortunately fell asleep before we could really start, but after that, I was paired up with another elderly lady, named Natsue. Doing calligraphy together with her was one of the most fun and interesting things I’ve done on this session. We talked a bit about the Kanji we were writing, Denmark (my home country), and Japan. Natsue-san really enjoyed herself too, and when we had to leave, she started crying- I must admit I came close to doing so as well. I was nice knowing that we had brought a bit of happiness to the residents though. I made a fan with the ‘dream’ kanji for her, and I got one with the ‘god’ kanji. 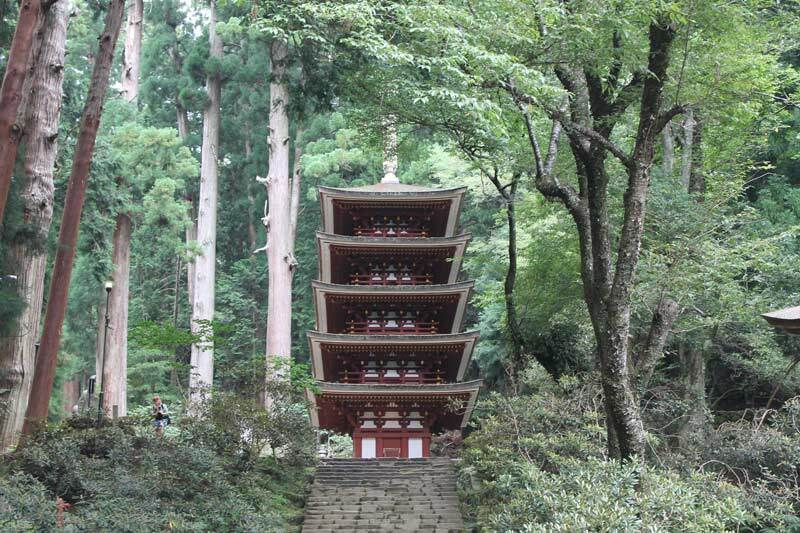 Later that day, we went to Moruoji Temple, a Buddhist temple located on a steep mountainside. After walking around for a bit with our guide, we took of our shoes and entered a small building where a Buddhist priest was chanting sutras (Buddhist verses). We learned quite a bit about the temple and Japanese Buddhism. Afterwards, we were told that we could ‘challenge ourselves’ by attempting the 400 step climb to the uppermost part of the temple at the top of a steep slope. The last part of the climb was really though on my legs (and lungs…! ), but the beautiful view and serene area at the end was definitely worth it. All in all, a great day indeed!